Installed an egress along with remodeling 630sqft of the basement. Crawford basements also made a custom barn door entryway into the unfinished portion of the basement. 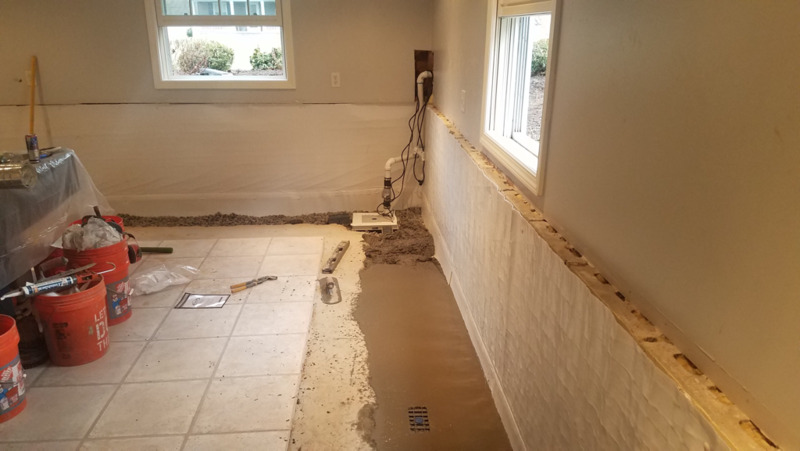 Crawford basements installed a partial Grate Drain drainage system in the area that was causing an issue. FAST PUMP along with a pump basin was installed as well. Everything was sealed drilled pinned tapped and caulked with thermal moisture barrier wrap. Crawford basements waterproofed 65ft for a partial waterproofing. Installed one sump and crock at one end of basement and then tied new drainage track to existing sump and crock. Construct walls, metal stud construction for mold control. Install mold and water resistant drywall and finish smooth (ceiling). Provide and install insulation in outer walls and ceiling. Install wall outlets. Provide and install recessed lighting and wall switches. Provide and install adjustable heat runs in ceiling. CO2 smoke detectors. Steel I beam drywall finish. Install soffit around main heating duct. Construct open stairway with oak cap. Install laminate flooring. Install flat screen tv. Provide and install 6 panel Masonite doors. Install double swinging door, six panel Masonite with trim. Install closet with shelving 18 inches deep 6 ft long. Install paint grade base molding approximately. Remove old window and replace with new glass block window with Center vent. Install trim around basement windows. Install trim around existing basement support poles. Install egress window with rock look outer surround and polycarbonate cover. Santa Fe whole basement dehumidification and air purifying system. Prime caulk and paint all walls, doors and trim. One color on walls and one color on trim. Install steel exit door in basement. Install steel flush garage entry door. Install tub shower walls. Provide dumpster for refuge. Install hidden door. Relocate washer and dryer. Prime caulk and paint all walls, ceilings, doors and trim. One color on walls and one color on trim. Provide dumpster for refuge. Construct walls, metal stud construction for mold control. Provide and install insulation in outer walls. Provide and install mold and water resistant drywall on walls and finish smooth. Provide and install wall outlets. Provide and install wall switches. Provide and install recessed lights. Remove plaster ceiling in living room and dining room. Install drywall ceiling in living room and dining room and finish smooth. Reinstall existing crown molding. Remove and reinstall heat run in dining room. Install drywall on dining room walls. Reinstall existing base molding. Kill mold on outer block walls, scrub walls to work in mold treatment. Remove insulation in outer walls. Construct walls, metal stud construction for mold control. Provide and install insulation in outer walls. Provide and install mold and water resistant drywall and finish smooth. Provide and install wall outlets. Provide and install wall switches. Provide and install recessed lights. Provide and install oval ducts for ceiling clearance. Provide and install suspended ceiling. Install access door for electrical panel. Provide and install adjustable heat runs. Provide and install base molding, paint grade. Provide and install doors. Provide and install double swinging doors. Construct soffit at stairway bottom. Construct open stairway with oak cap. Install trim around existing basement support pole. Install drywall around steel I-beam. Construct soffit around main heating duct. Provide and install fluorescent lighting for closet. Install closet shelving. Provide and install glass block window under deck. Install trim around existing basement windows. Prime caulk and paint all walls, doors and trim. Prime caulk and paint all walls, doors, and trim. Remove refuge. Provide and install recessed lights. Provide and install suspended ceiling. Provide and install adjustable heat runs. Provide and install base molding. Provide and install doors, six panel Masonite with trim. Provide and install double swinging doors. Remove existing door and install sliding glass door. Construct soffit at stairway bottom. Install access door for plumbing cleanout. Install waterproof laminate flooring. Construct drywall soffit. Install access doors for Grate Drain ports. Install trim around existing basement windows. Install closet pole and shelf. Install basement windows sliders. Install drywall ceiling and finish smooth. Construct soffit around main heating ducts. Install 1 co2 smoke detector. Remove existing walls. Construct walls, metal stud construction for mold control. Provide and install insulation in outer walls. Provide and install mold and water resistant drywall and finish smooth. Provide and install wall outlets. Provide and install wall switches. Install toilet, vanity, shower unit and faucets. Provide and install bathroom exhaust fan. Install GFI outlet. Install vanity light. Provide and install smoke detector. Install trim around existing basement support poles. Prime, caulk and paint all walls, doors and trim. One color on walls and one color on trim. Provide dumpster for refuge. Provide and install Grate Drain Antimicrobial drainage system with accessible port. Install dimple shield for water transfer across footer. Install finish shield. Provide and install Grate Sump and Fast Pump. Remove and dispose concrete. Remove outer walls. Remove concrete and dispose. Provide dumpster. Provide and install Grate Drain Antimicrobial drainage system with accessible ports. Install dimple shield for water transfer across footer. Install finish shield. Provide and install Grate Sump and Fast pump. Install exterior drainage. Install stair railing, oak railing with paitned balusters. Prime, caulk and paint all walls, doors and trim. Remove refuge. Install egress window with rock look outer surround and polycarbonate cover. Install base cabinet and countertop. Install kitchen sink. Construct walls, metal stud construction for mold control. Provide and install insulation in outer walls. Provide and install mold and water resistant drywall and finish smooth. Provide and install wall outlets. Provide and install wall switches. Provide and install recessed light. Provide and install double swinging door. Provide and install doors, six panel Masonite with trim Provide and install suspended ceiling. Provide and install adjustable heat runs. Install waterproof laminate flooring. Provide and install base molding. Install fluorescent lights in suspended ceiling. Install co2 smoke detector. Construct soffit at stairway bottom. Construct soffit around main heating ducts. Install trim around existing basement support pole. Relocate hot water tank. Provide and install oval ducts for ceiling clearance. Remove concrete and dispose. Provide and isntall Grate Drain Antimicrobial drainage system with accessible ports. Install dimple shield for water transfer across footer. Install finish shield. Provide and install Grate Sump and Fast Pump. Remove outer walls. Spray and remove mold on outer walls. Provide and install Grate Drain Antimicrobial drainage system with accessible ports. Install dimple shield for water transfer across footer. Install finish shield. Provide and install grate sump and fast pump. Install fast sump power inverter, backup power. Provide dumpster.